Organizations may often face situations where they need to recruit persons who are not actively looking for new work opportunities. Headhunting processes provide organizations with means to hire persons to fill key positions that are not marketed for in the open labor market. In these instances the positions are such that they are filled if and when a suitable person with the right qualifications is found. Usually the hiring organization has clearly defined the competences, abilities, training and qualifications they expect the chosen person to meet. Headhunting has traditionally been utilized to hire persons for managerial and expertise positions. However, especially in the sectors where the demand for labour force exceeds that of supply it is becoming more common to utilize headhunting. This goes especially for various sectors with seasonally varying labor force demand. Good salespersons are always on the short supply. Similarly, globally moving experts are hard to find using only traditional and local means of recruitment, to name few challenges facing organizations. Headhunting processes have previously been very labor intensive, something that still makes them very costly and often a last resort solution. Even organizations that provide B2B recruiting services may face the challenge of finding right kind of candidates among their large pools of available persons looking for new work opportunities. 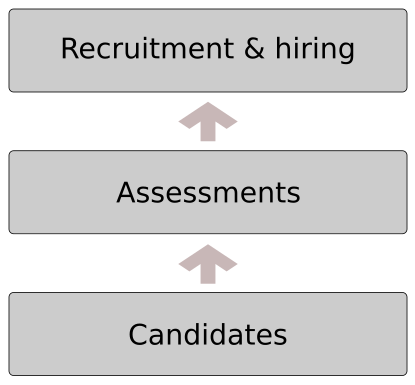 There will often be a multitude of candidates who meet the basic training and work experience qualifications, but with no information to help assess their personality or competences, let alone leadership qualities or potential developmental challenges, it is difficult to decide whom to lift up and recommend to client organizations for further consideration. Combining available information resources with the Mindfindr assessment service offers businesses new technologically savvy ways to support recruitment processes. Traditionally a headhunter expert goes out to search for a right kind of candidate as defined by the client organization. The use of various workable data resources for the purpose is constantly on the increase. Various web services retain, search for and process information on their users and the information may also be, if allowed by the users, further processed to facilitate the work of HR consultants. Various organizations have large ready-to-use information resources on the service users or the pool of applicants, eg. contact info, CVs, status on the market, whether between jobs or not. Nowadays all savvy web service providers try to make the best possible use of the user information they have gathered for any purpose whatsoever. Still, it may sometimes go unnoticed by some of the service providers that they could with minimal marginal costs increase the net worth of their data resource utilization. Combining data resources with the Mindfindr assessment and recruitment service toolkit would offer these operators new sources of revenue with minimal marginal costs and with just little extra effort to integrate their services with Mindfindr by utilizing the state of the art integration solutions offered by Mindfindr. It is worth noticing that combining these services yields value to the users of the services, irrespective of the primary function or use of the information. Why not put the information gathered to the fullest possible use! Picture. A general idea of Mindfindr as part of a selection process utilizing a data pool. Mindfindr allows the user organization to monitor and scan a whole pool of persons in relation to a certain specified position, profession or occupation of interest. Mindfindr service can be utilized as an independent service but most effective and marginally most useful Mindfindr is when used as part of a larger rating framework or an assessment centre. 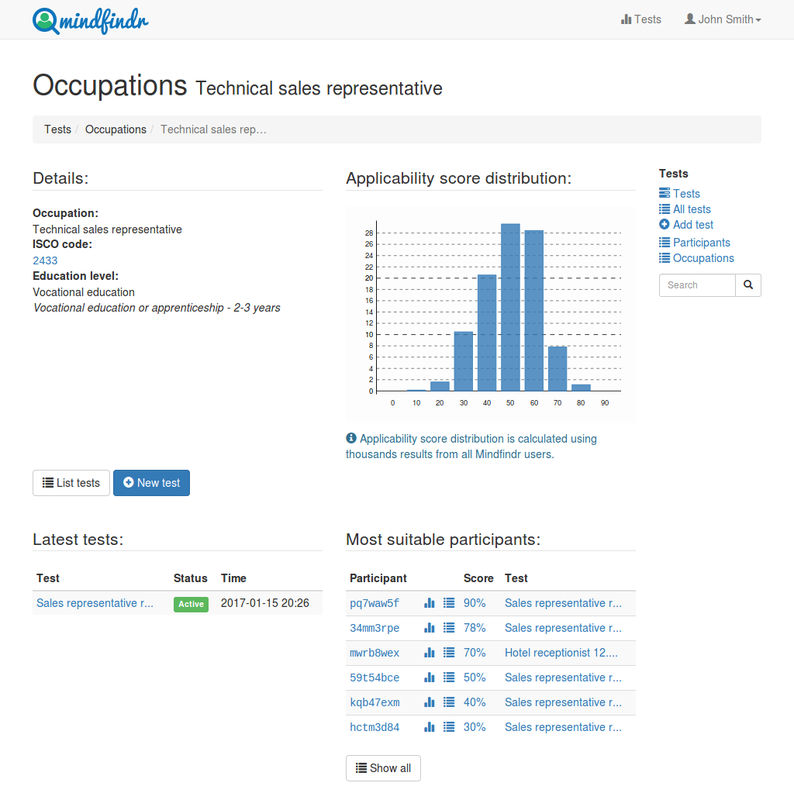 In Mindfindr applicants may be ranked according to any profession or occupation. The suitability estimates for all applying persons can be compared with each other or more comprehensively with all evaluations in the Mindfindr service to help more objectively consider the level of applicants. Picture. The suitability of the specified candidates for a certain position (a selection of sales booster candidates).